Contact our office for help with your next PEG tube or nursing home case. We can assist with location of nursing and physician experts, retrieval of articles supporting the standard of care, preparation of timelines and chronologies, and other demonstrative evidence. Although feeding nursing home residents through PEG tubes is common, medical evidence questions whether it prolongs life or reduces the risk of aspiration. Indications for PEG tube insertion include head and neck cancers, acute stroke with persistent swallowing difficulty for one month after hospital discharge, neuromuscular dystrophy (weakness) syndromes, and gastric decompression (such as occurs when bowel cancer causes obstruction). Gathering evidence shows that this popular method of providing artificial feeding is associated with a significant risk of complications. Placement of PEG tubes requires an invasive surgical procedure. While the operative procedure is usually safe, there are serious complications. Some of these include migration of the tube out of the stomach, necrotizing fasciitis (“flesh eating disease”), fluid overload, aspiration pneumonia, peritonitis, abdominal abscess, bowel obstructions, gastric perforation, GI bleeding, and restraint use. Less severe but still uncomfortable symptoms include pain at the tube site, tube malfunction, stenosis of the opening, local bleeding, skin excoriation, wound dehiscence, cellulitis, gastroesophageal reflux, diarrhea, and nausea. Residents lose social interaction and dignity. In 1999, 34% of severely cognitively impaired residents of United States nursing homes had PEGs. 1 Yet there is no evidence that tube feeding residents with advanced dementia prolongs survival, prevents aspiration pneumonia, reduces the risk of pressure sores or infections, improves function or provides comfort. Use of a feeding tube in a demented patient is associated with significant increases in restraint use, utilization of the emergency department, and hospitalization. Residents who develop swallowing disorders after a stroke are often considered candidates for a PEG tube. In one study, 8 months after PEG placement, 45% of the patients had died, 25% lived and had the PEG removed, and 30% lived with a permanent PEG. 2 However, only about 20% of patients have dysphagia after stroke, and it resolves within one month 80% of the time. If the physician waits for a month and provides short term feeding with a NG tube, the majority of PEG tube insertions might be unnecessary. A new device, the nasal loop, is useful for avoiding unnecessary insertions of PEG tubes. Nutrition is delivered through a nasogastric tube that is looped into both nostrils. Short term delivery of tube feeding solution through a nasogastric tube permits stroke patients sustains life while allowing time to recover normal swallowing ability. Insertion of PEG tubes is commonly advised to reduce the risk of aspiration pneumonia (caused by vomiting and inhaling stomach contents). Yet there is no data to show that feeding tubes really do decrease the risk of aspiration pneumonia. Patients with neurogenic dysphagia fed with PEG and nasogastric tubes had similar rates of aspiration pneumonia. 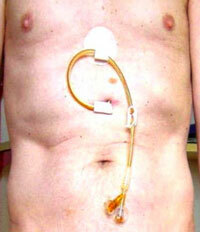 Tubes placed in the jejunum did not provide a reduced risk of aspiration either. What drives the pressure to insert PEGs? A complex series of emotional, institutional and financial factors affect the provision of artificial nutrition. Families are usually reluctant to withhold or withdraw nutrition from loved ones. Physicians often find it easier to recommend or perform a non-beneficial procedure than to confront difficult and time-consuming end-of-life issues. Saying yes to family request for insertion of a PEG tube avoids an emotional discussion of the resident’s poor prognosis and the appropriate goals of care. Nursing homes may require PEG placement for admission to the facility due to staffing, regulatory, or legal concerns. Nurses and speech therapists may promote PEG insertions in this setting. PEG placement may be a valued source of physician income and referrals. Hospitals may encourage PEG placements to generate revenue (though data suggest they actually lose money on inpatient insertions.) It costs nursing facilities significantly less (and they are reimbursed more) to feed severely demented patients by PEG tube than by hand. At the conclusion of this presentation by Dr. William Plonk, there was a heated audience debate. Some of the physicians in the audience heatedly disagreed with the conclusions of the studies. Citing descriptions of nursing home residents who have been maintained on long-term nutrition through PEG tubes, they challenged the concerns about PEG tubes. Dr. Plonk reiterated the findings of the studies citing the disadvantages of PEG tubes. An attorney involved in a nursing home PEG tube misadventure should ask: Should this tube have been inserted at all? Mitchell, S et al. Clinical and organizational factors associated with feeding tube use among nursing home residents with advanced cognitive impairment, JAMA 2003: 290: 73. Ha, I, Hague, T. Percutaneous endoscopic gastroscopy for enteral nutrition in patients with stroke, Scand J. Gastroenterology 2003: 9:962-6. Gauderer, M. Twenty years of percutaneous endoscopic gastrostomy: origin and evolution of a concept and its expanded applications. Surg Endoscopy 1999, 50: 882.